Heat oven to 375°F. Place chicken on microwavable plate; microwave uncovered on High 1 minute; cut in half. Separate dough into 8 triangles. Cut each triangle in half lengthwise to make 16 narrow triangles. Place on ungreased cookie sheet. Place chiles and chicken piece on shortest side of each triangle. Roll up dough, starting at shortest side, wrapping around chicken. Brush with dressing. Bake 12 to 14 minutes or until golden brown. Let stand 3 minutes. Serve with remaining dressing. 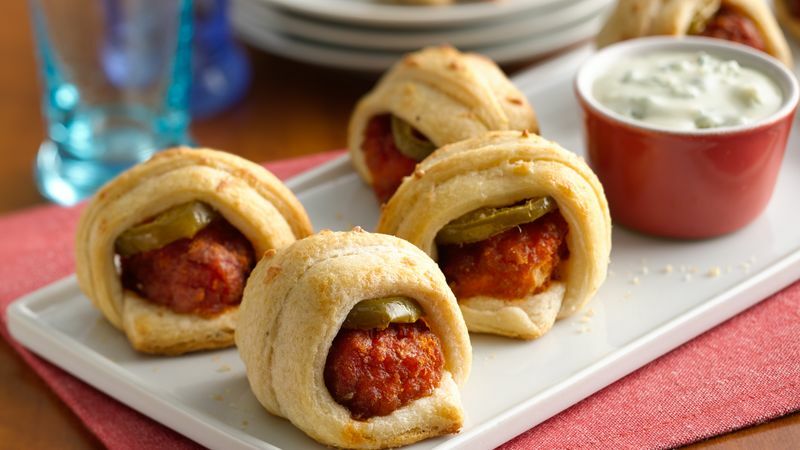 Serve these flavorful poppers for game day. Make a quantity and use different dipping sauces.